Last Friday Mike “Grandma” McFadyen was involved in a bad wreck. Without disclosing too much information, he’s laid up in the hospital with a punctured lung, spinal damage and other serious injuries. Luckily he was wearing his helmet. 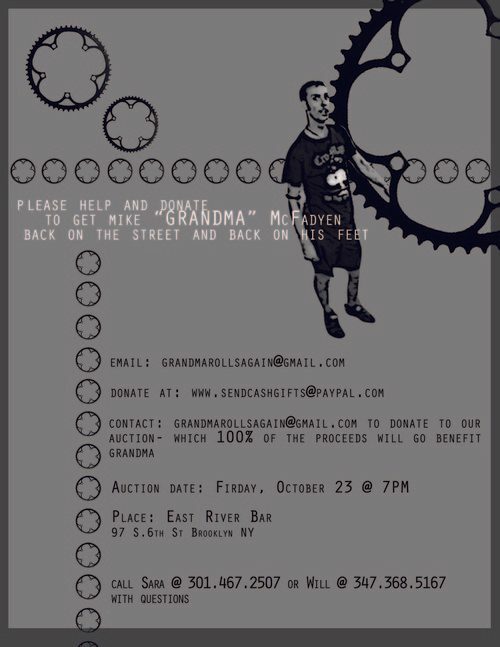 To help aid in supporting him, the NYC community has set up a relief fund and an auction. Details are on the flier. Mike, get well man and everyone please, ride safe!